This is not what Marie Antoinette, the young ravishing French Queen had in mind when she spoke her famous “Let them eat cake” as Paris burned – or was that Nero in Rome? Doesn’t matter. 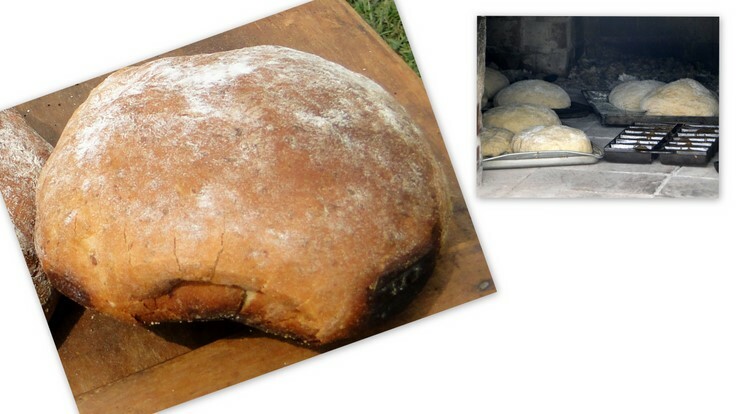 “Cake” in the 18th century was the semi-charred bottom of a loaf of bread – at least the cook hoped it was only semi-charred – the result of thin sheet pans sitting directly on the hot bricks of a wood heated oven. The cook would slice off the charred bottom section and send the “upper crust” of the loaf to the dining table. The Queen was suggesting that the tens of thousands of bottom crusts – the cake – from the bread shops be distributed to the poor instead of going to the pigs…misinformation…it’s enough to make you lose your head. 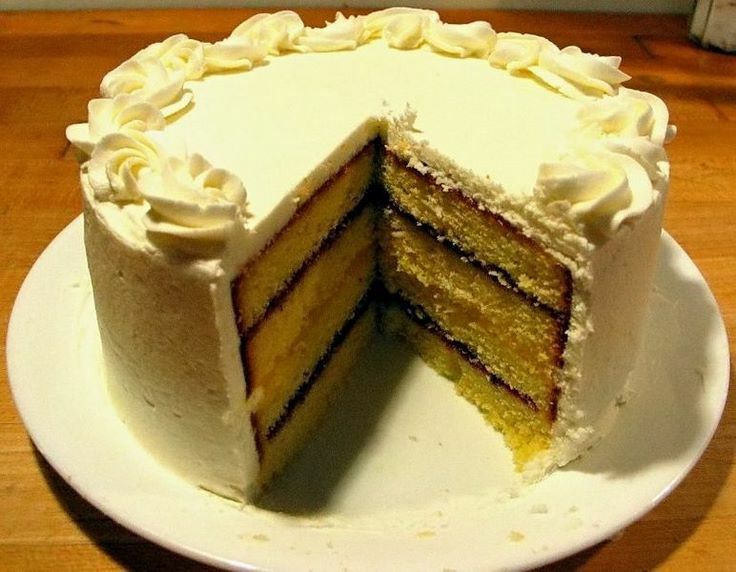 The delectable 8″ lemon and raspberry cake, in the first photo, was purchased for $23.00 at the Night Kitchen, Chestnut Hill’s (Philadelphia) premier bakery, for my wife’s birthday. Prior to 1856, making such a cake would have cost dearly in real money, and it all had to do with the one simple ingredient of the egg white. Only rich households could afford the expensive sugar, flavorings and the hired help that would laboriously hand whip the egg whites in copper pans to produce the essential white foam required to help lift the batter into the light texture we so prize in a cake – not to mention getting the oven temperature correct. It took American ingenuity to bring this über luxury into the middle class home. Why is this genius? What we take for granted as a simple device was, in reality, a seminal invention – a gear mechanism responsible for such essential tools as the hand drill for everyday home use, the oil drill exploring for “black gold” and the automobile transmission. But first it revolutionized the kitchen allowing for today’s bakeries, Dunkin Donuts and Mom’s birthday cakes for the children. I was eleven years old when I graduated from box cake mixes and wanted to make real cakes. The dreaded egg whites where the killer. Coming from a family that enjoyed good food, at restaurants, but had no time for home cooking, it took a lot of trial and error before I mastered the technique. (1) always seperate cold eggs, dropping the white, one at a time, into a small bowl and putting the yolks into a seperate bowl. (2) Check the white and make sure there is not even a speck of egg yolk in the white. Any yolk at all will cause the whites to fail. Transfer the whites, one at a time, to a clean, grease-free mixing bowl. Repeat this until you’ve seperated all the eggs. (3) The egg whites must sit at room temperature for one hour – cold egg whites will not produce the necessary volume. (4) Make sure the mixer’s dashers are grease free and clean. Whip at high speed until soft peaks form, hold but gently fold over as you lift the dashers. Do not over mix because the whites will become stiff and actually lose the essential air that’s been incorporated. (5) If you are making a meringue, start adding the sugar once the whites begin to foam, but, sprinkle the sugar slowly as the whites are beating. Adding the sugar too fast will cause the whites to collapse. My 140 egg beater collection (at current count) started some years ago. 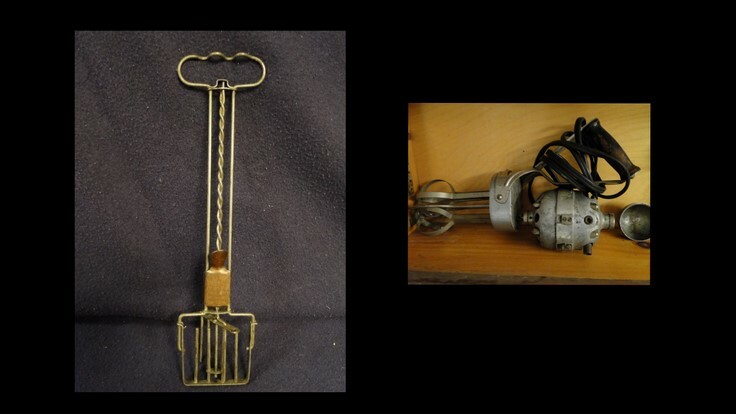 I always liked old tools, but it was an uncle that piqued my interest in the egg beater over 25 years ago when he gave me my first two antiques. Curiously the one on the left, above, is not based on the 1856 gear mechanism but rather the 3rd century Archimedes screw principle. This rare 1906 beater was considered by its inventor, George Flowers of Philadelphia, to be an improvement because of its lack of gears that could get out of alignment. In 1921 a patent was granted for a portable hand-held electric mixer. 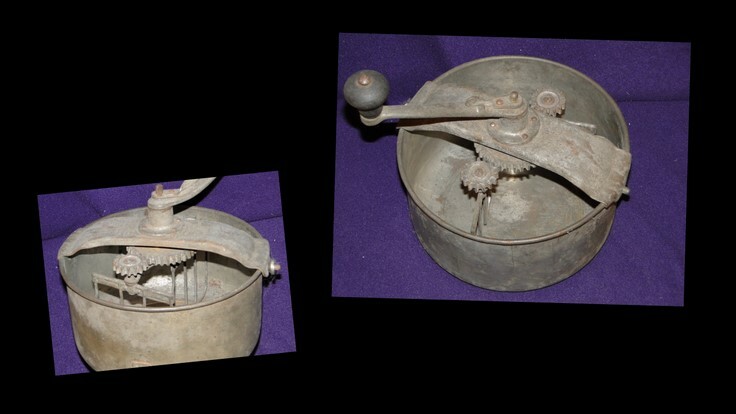 Hamilton Beach made the motor and Dormeyer marketed the beater. The motor housing detaches so the dashers can be washed. It still works fine. 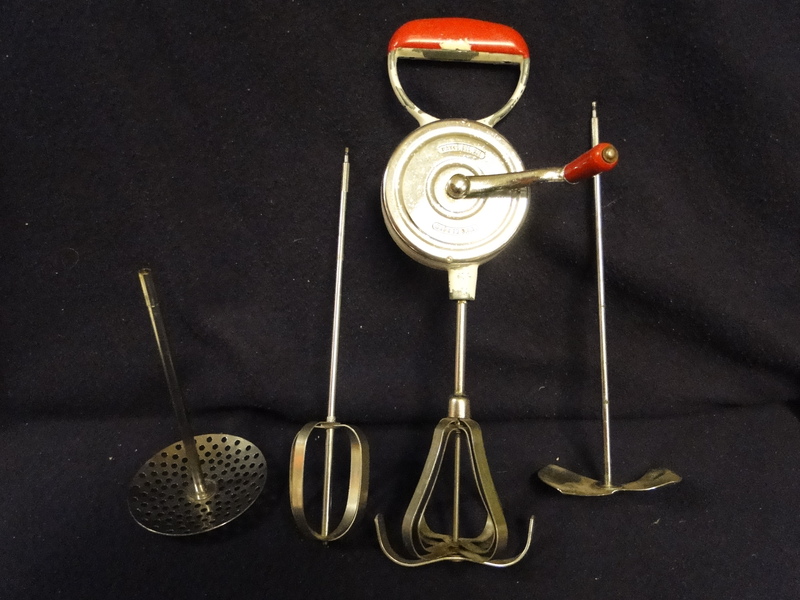 Years later, as a Chef/Educator, student interest in old kitchen tools led me to explore antique markets, and ebay, where I discovered a new world – the enormous variety of eggbeaters, their ingenuity and fascinating industrial designs. 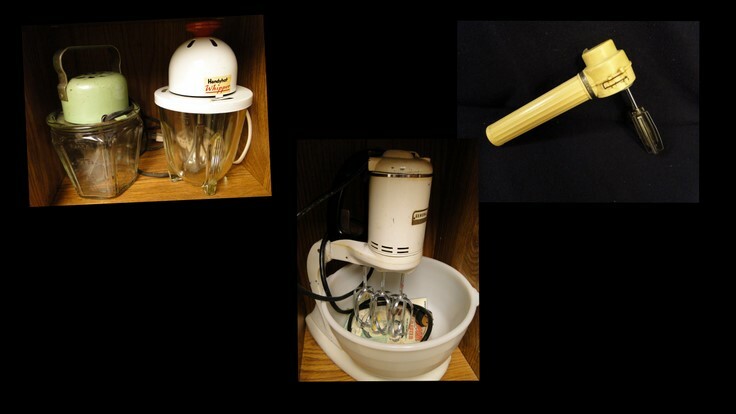 From beating egg whites, inventors turned to simplifying other common kitchen tasks. Heavy cream splatters when beating to create whipped cream. Although incorporating air into cream is necessary, it doesn’t require the volume traditional dashers provide. By the late 1800’s inventors were creating flat, horizontal dashers. The 1897 Lyon has a unique set of double dashers that rotate in opposing directions. 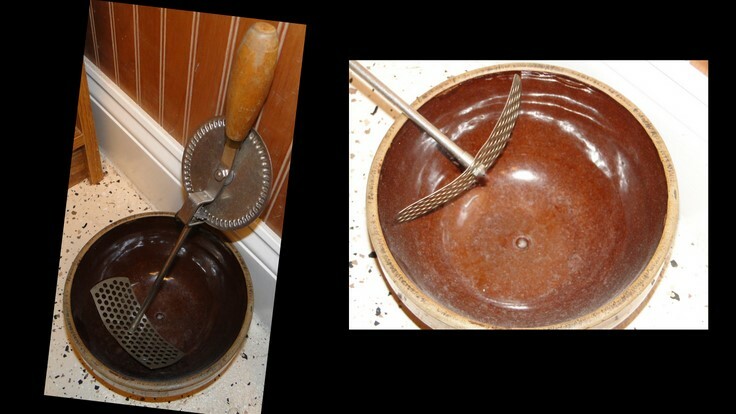 The Dunlap Sanitary Silver Blade came with a dedicated ironstone bowl with an indentation that fit a tip on the blade’s bottom to keep the beater in place. Other designs were meant to fit into dedicated glass jars. Everyone wants to avoid splattering their clothes. 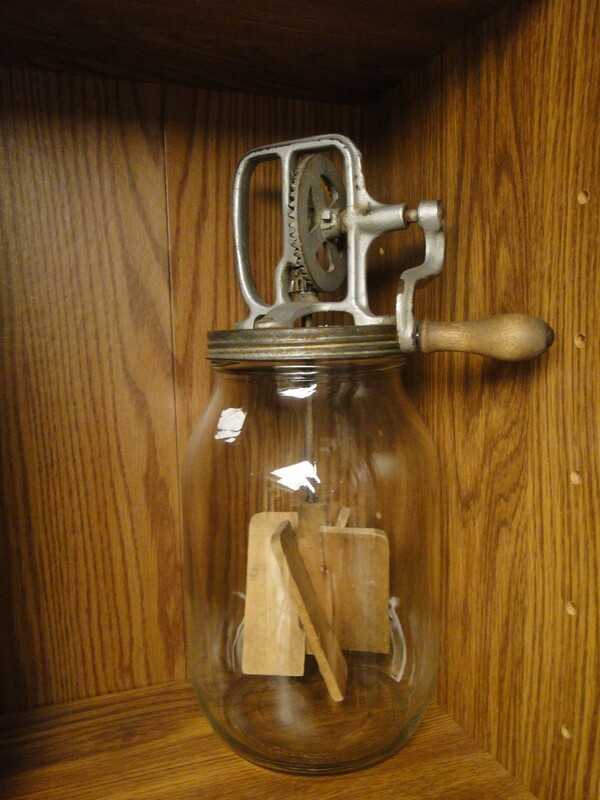 Putting a beater in a glass jar had been an idea since the 1880’s. Besides the rotary gear and the Archimedes slide screw, a basic spring coil that agitates the mixture is a common mechanism in many beaters. 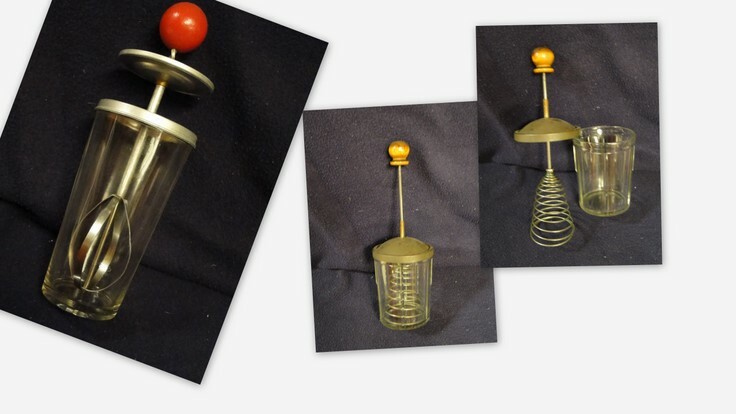 One ingenious device marries the Archimedes with a counter weight that spins a single dasher in continuous motion just like a child’s toy top – the 1939 Jiffy Mixer. By the 1920’s, heavy cast iron egg beaters were losing their appeal. For a collector, the cast iron beaters are beautiful with elaborate and imaginative designs – the golden age. For the cook they were heavy, brittle and the gears needed constant lubrication and adjustment to stay aligned. By the early 20th century, tin and aluminum were replacing cast iron. Many tin beaters were inexpensive and flimsy – like early plastic – but the aluminum beaters were innovative, extremely light and high-end. Louis Ullman, New York City, patented his all aluminum American Beauty and created an instant success. Clarence Elliott of Kansas City developed a high-end, sturdy beater sought after by collectors and known as “KC’s.” Inside the round dashers he placed additional round rings dubbed “soap bubbles” which aerated a mixture with great efficiency. His 1935 model with a folding side handle is a particularly nice design. In the 1920’s less than 50% of the American population had electricity in their homes. 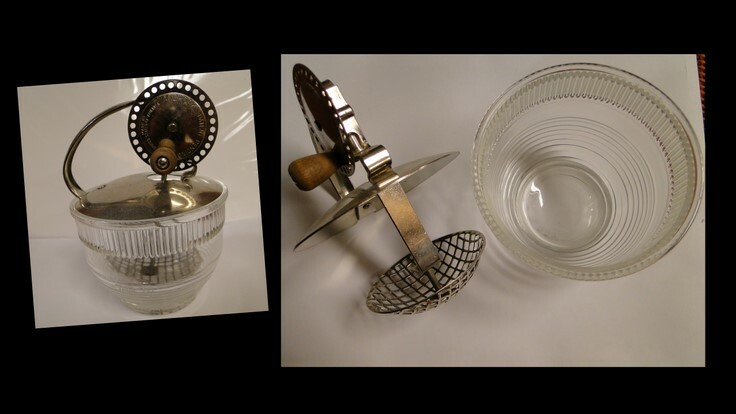 Water powered glass jar eggbeaters were the high-end kitchen tool in these households. Operated by attaching a hose or tightening a faucet connection, water circulated through the cap turning the dashers – the water emptied down the tube. Even better for the thrifty farm cook, the mechanism attached to a standard one quart Ball canning jar. 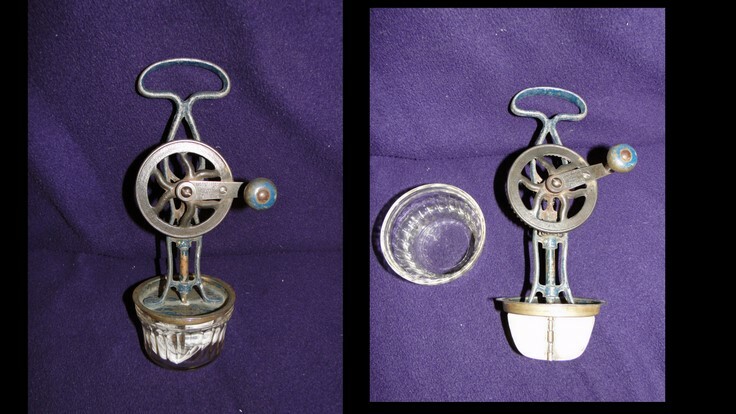 Before 1860, making butter was a laborious process of aerating the cream by plunging a wood dasher up and down. 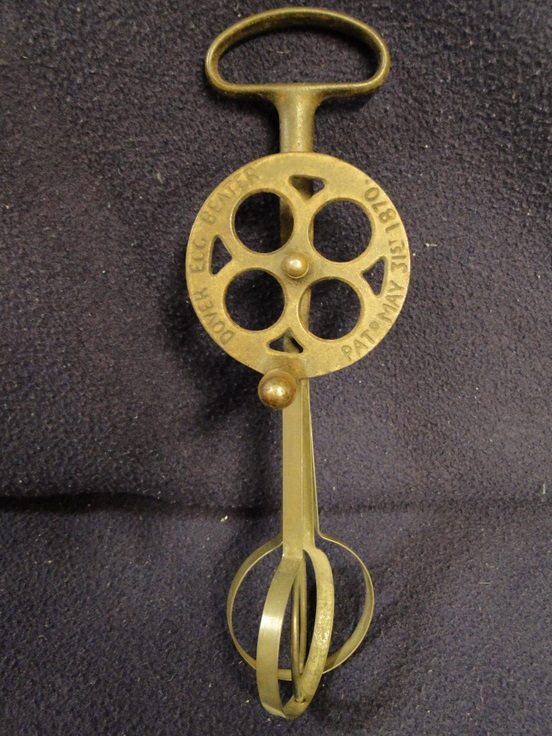 The egg beater gear mechanism revolutionized butter allowing any kitchen to make fresh butter, and its accompanying butter milk, in “two minutes.” Actually, it took about five minutes when I use the 1914 Two Minute butter churn. Mayonnaise has been a beloved sauce, especially in France and Spain, since the early 1700’s. Its preparation by hand, even today, requires patience, skill and time. Prior to the egg beater, the whole eggs had to be beaten with a whisk for a considerable amount of time while the oil was added drop by drop. Adding the oil too quickly – faster than a drop at a time – will cause the eggs to stay flat and thin because the oil will fail to bond with the yolk protein during aeration. 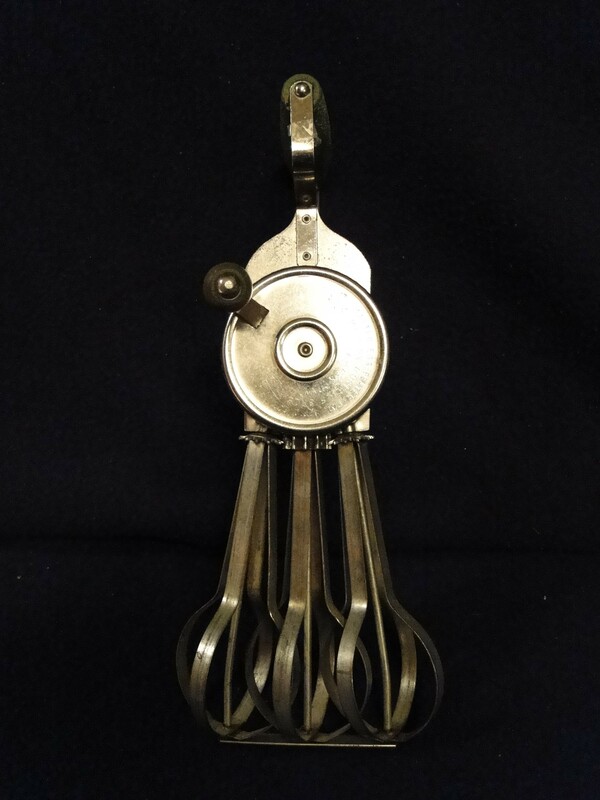 Not only did the eggbeater lessen the hand drudgery, but the ingenious addition of an attached funnel allowed the cook to control the drops of oil by adjusting a valve. 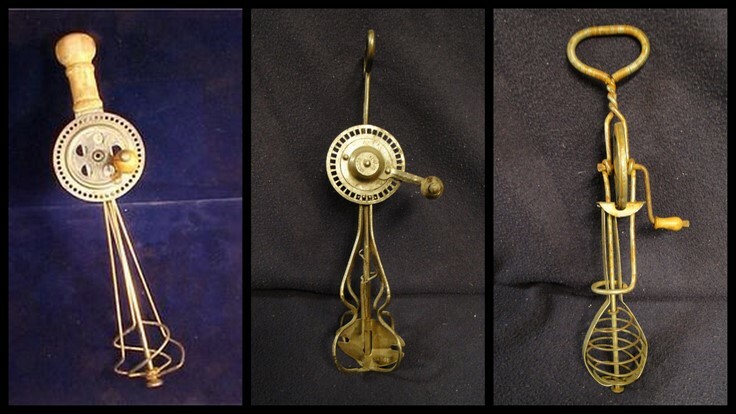 The French created fanciful designs for their dashers, as evidenced by the above three egg beaters. These Archimedes beaters, above, attest to both interesting designs and marketing. The second from the left, with the jar, is English, Horlick’s Malted Milk powder, created by the aristocratic Horlick brothers, but manufactured in Racine, Wisconsin for the American market. Their simple beater and jar, which included the mixing procedure, was frequently included for free when a customer purchased their first supply of powder. 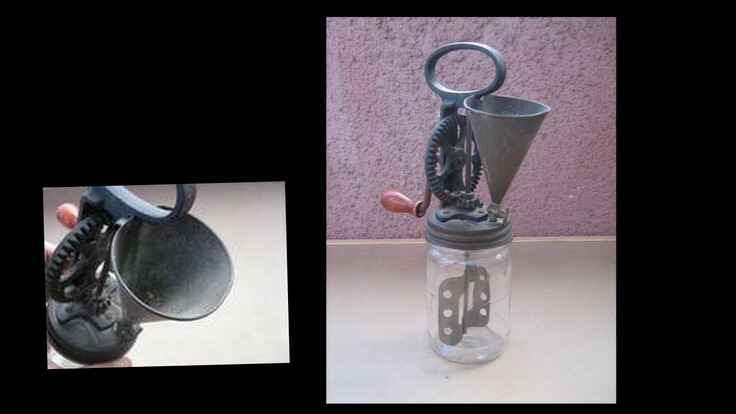 Labor saving devices were the hallmark of the Industrial Revolution. 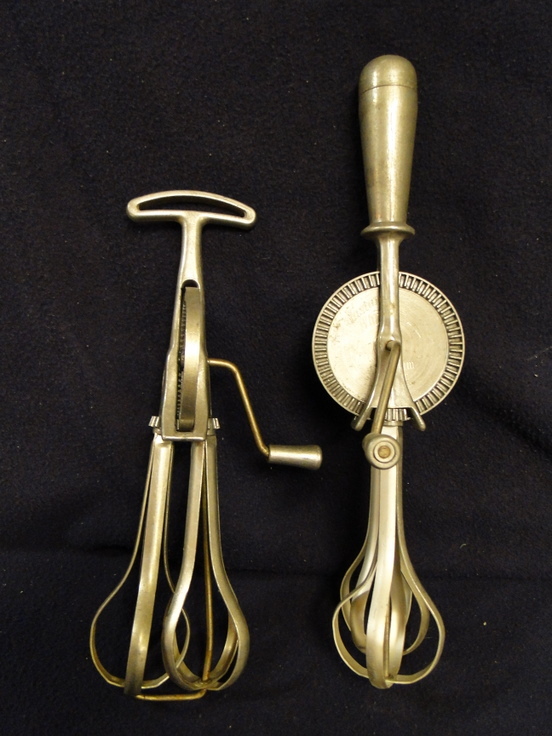 The 1905 Universal Cake Mixer went one step further allowing the baker to combine all ingredients and gently fold the beaten egg whites into the batter. The Yoder Food Mixer’s interchangeable dashers was revolutionary for a hand mixer. Its encased housing allowed easy lubrication of the gears providing, to this day, smooth operation for all mixing needs. My two personal favorites are the Aureluis Brothers triple dasher and the Maynard Master Mixer. The triple dasher is the only one of its kind manufactured in the United States. 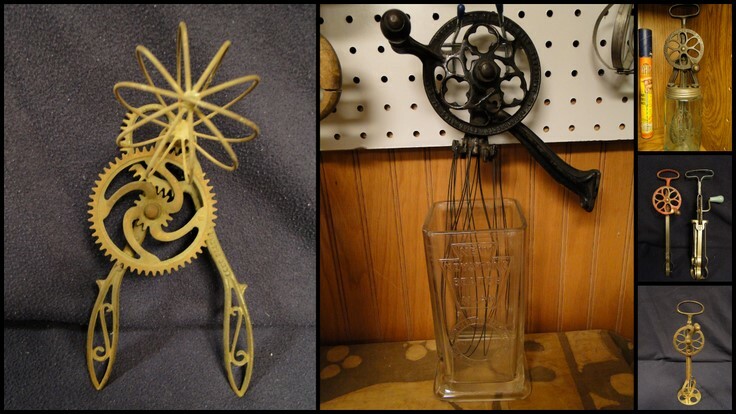 Even though the Aureluis Brothers Co. of Braham, Minn., made many types of tools, it was Eugene Aureluis who became fascinated with the egg beater. 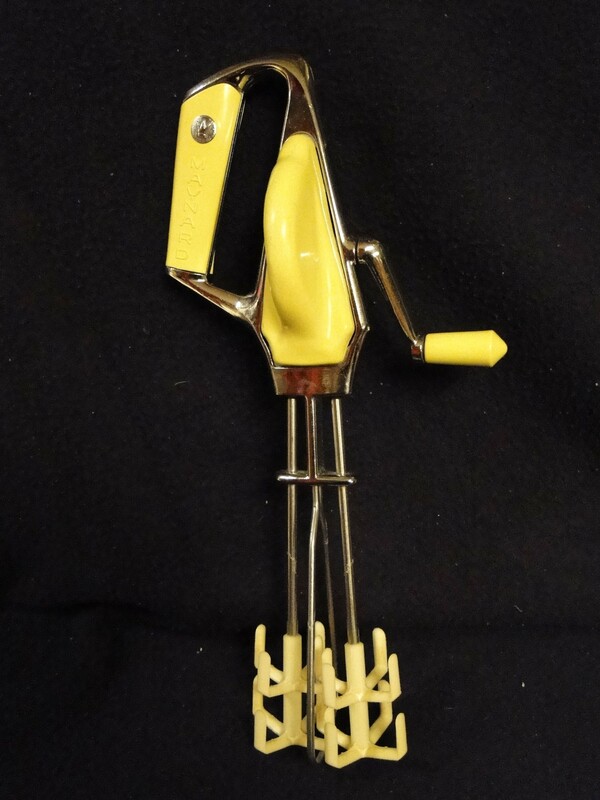 From 1926 through 1949 he designed and manufactured 4 egg beaters that were built to last. 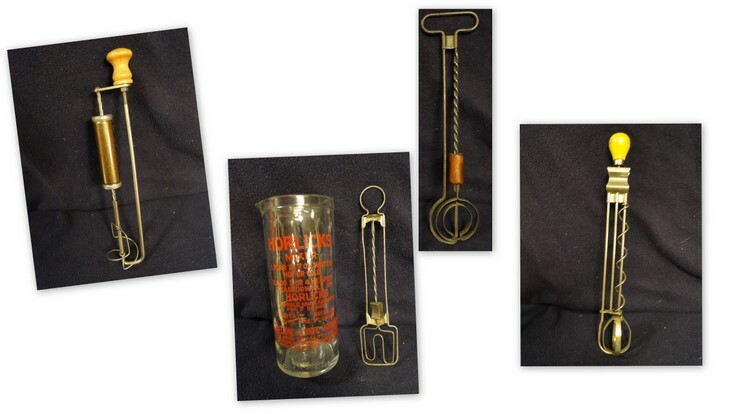 Although the company no longer makes egg beaters, it is still in Braham and owned by the second generation of one of the company’s first employees. 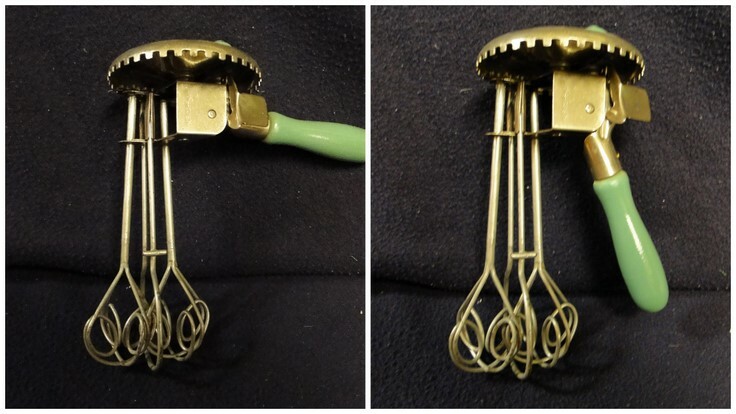 The Maynard Manufacturing Co. of Glendale, CA, made some of the finest manual eggbeaters ever. Once more, they were like tanks and used state-of-the-art materials such as stainless steel and nylon. The gears were encased in hard plastic with a hole to add lubricating oil. The 1950 Master Mixer was based on a 1923 design. The dashers minimize splashing by using hard nylon plastic. 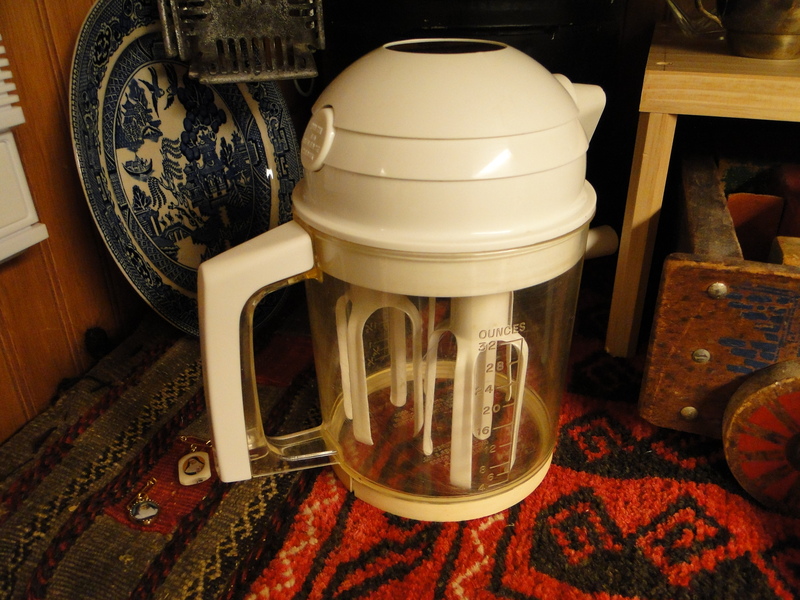 The Master Mixer was awarded New York City’s Museum of Modern Art (MOMA) award for industrial design and is part of their permanent kitchen tool collection. Oddly, the beater to the left looks similar to the Master Mixer, but it’s a cheap knockoff. Perhaps Maynard sold this design to Stanhome, Inc. of Westfield, MA. 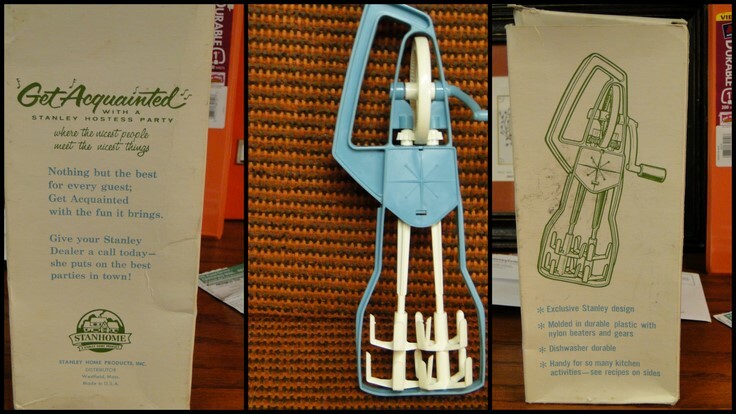 It’s a flimsy plastic version that was a house gift for a Stanley Hostess Party, a 1950’s “tupperware-like” house party event for kitchen and household products, in the days before Wal-Mart. The Soviet dominated East German manufacturing industry was infamous for making shoddy products and the Gloria, (below left) is a prime example. Despite its similarity to the Maynard, the plastic housing encloses gears that rattle and the beater would definitely not last long under constant use. 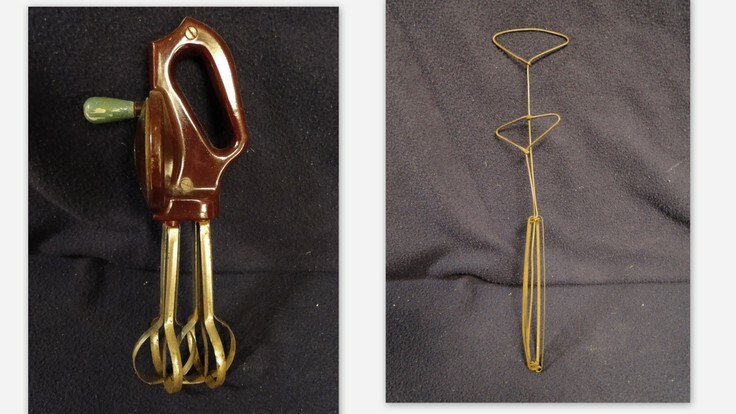 The thin wire squeeze whip on the right, below, is of unknown origin and, hopefully, few were ever manufactured. Ron Propeil, founder of Ronco Industries, was a true American marketing genius. Following a long tradition of traveling salesmen and hawkers, he created the TV infomercial that is the solace of so many people awake at 3:00 a.m. Versions of his inexpensive inventions remain on the market today – the Veg-O-Matic, the Chop-O-Matic and the Whip-O-Matic. Combining inexpensive plastic, Hobart planetary dasher design and marketing chutzpah, Propeil launched an empire, created an entire advertising niche and earned a devoted following among collectors and consumers looking for cheap products. 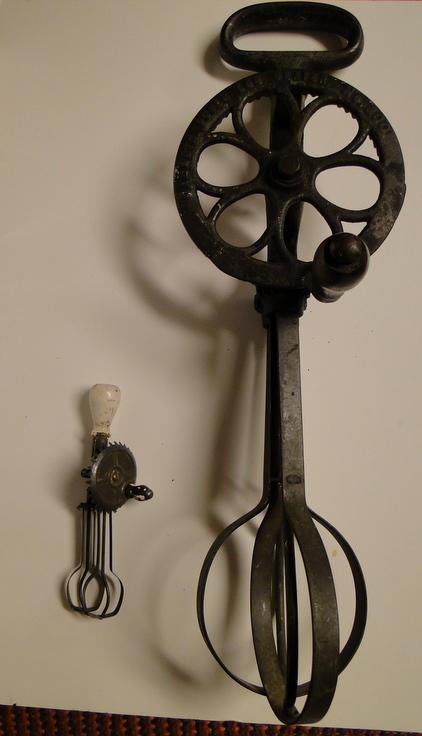 The first electric egg beater, meant for commercial baking, was granted a patent in 1885. It was a huge machine with a fan belt running from the motor to the gears that turned the dashers. Yet it was not long before the lure of electricity was pulling the affluent household away from the ingenuity and beauty of many hand beaters. An interesting 1930 example was the Bersted mixer. Mr. Bersted was infamous for purchasing profitable companies and eviscerating their tools turning them into cheap products. He would then sell the company before his scams caught on. The Eskimo Co. had a reputation for excellent electric fans. Bersted simply took the fan motor, added a handle and shaft with a blender blade and sold it as a milk shake mixer. Few of his “reinvented” companies survived after he bailed out with hefty profits. 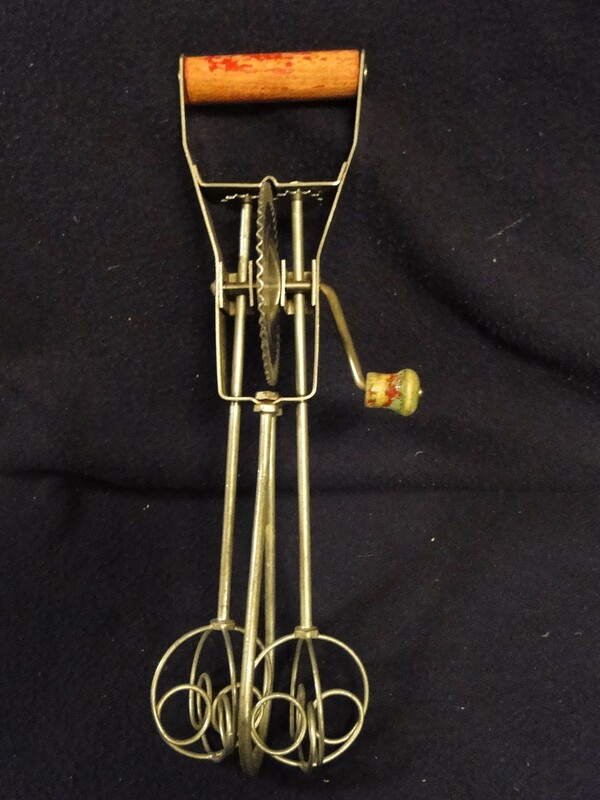 Herbert Johnson, in 1908, revolutionized the electric egg beater through his invention of “planetary action” in which an individually rotating beater travels in one direction around the inside of a mixing bowl while the dasher revolves in the opposite direction resulting in superior mixing. Johnson envisioned that his mixer could accommodate a plethora of attachments from beater, whip, bread hook, meat grinder, juicer etc. – a total kitchen appliance. When the Hobart company began marketing the KitchenAid in 1916 it sold for the very high-end price of $189.50 ($2,400 in 2010 dollars.) 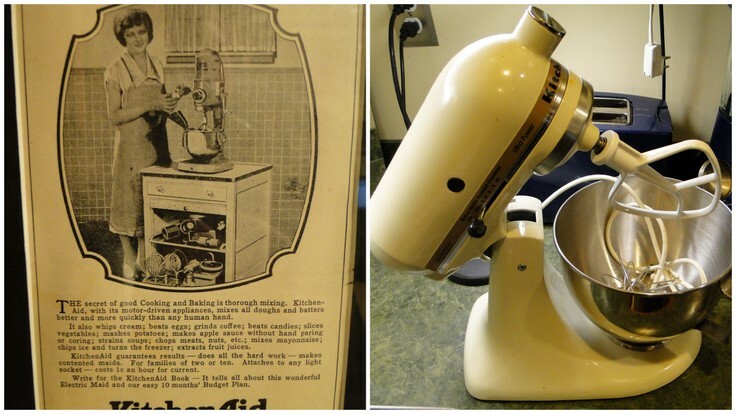 Today, an average KitchenAid sells for less than $300. The world of the eggbeater is vast and this article simply introduces the story. It revolutionized home and commercial baking. 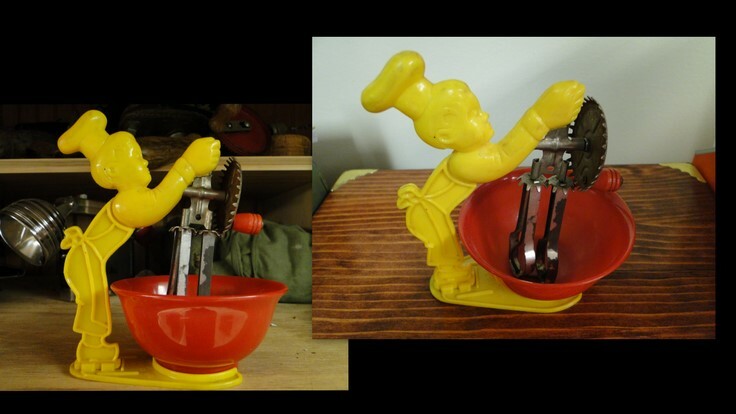 From the 16 1/2 inch cast iron Dover Mammoth 300, weighing 6 pounds, to the Taplin child’s toy beater, the Betty Taplin, weighing ounces, the eggbeater is a true American success story. My use of the word story is deliberate, because what is ingenuity but the personal stories of visionaries. Great article. I love item-specific history books, because it allows you to view a familiar historical timetable through the historical importance of something seemingly very small. The sculptural forms of these egg-beaters are mouthwatering alone. I am a long time collector of egg beaters. I’ve always loved their simple mechanicalness and love their 1950s aura. They hang on a wall in the kitchen. But I had no idea the vast variety of shapes and designs like the ones described here and shown in the photos. Thanks for the egg beater lesson! Marc, this was fascinating! But I’ve often wondered, who was the very curious, or bored, certainly persistent early ancestor who discovered that egg whites are transformed by HOURS of hand beating? Ditto for cream. It doesn’t seem like this discovery could happen by accident, like fire. Any clues to this important milestone in culinary history? Thanks Wendy. Now you have be thinking about that early ancestor!! So hungry seeing all the food! Yum yum. Really enjoy reading the history lesson and wonderful pictures. Thank you for the nice comments! AND thank you for mentioning me on your blog!! Cool stuff you show here and timely! I’m a food scientist (PhD in Dairy) and very passionate cook. I have been deeply involved in the science of cooking for almost 5 years now during which I have worked with world-renowned chefs on the topic, have written several articles and hopefully, my book (the kitchen as a laboratory) will be published next year. Thank you for your interest in my blog. I’ll send more information by email tomorrow. Well, well. You are the first person I have ever come across to really explain Marie Antoinette’s comment, including the “upper crust” and the feeding-to-the-pigs details. But where did you learn it? Thank you for your compliment, Nancy. I hold a MA in history, but more importantly for this particular knowledge is that I am a volunteer historical interpreter at Valley Forge National Historical Park. The truth behind the quote was gained through several primary sources based on accepted culinary terminology of the day. You may want to take a look at my blog: Valley Forge: A reality Show. Have a great new year! Thank you for your comment. Your GE certainly does have antique value. I’m currently traveling in Southeast Asia and do not have my reference materials with me, but if your mixer has the original cloth covered electric cord in safe condition, than given the right selling environment it’s worth at least a few hundred – it’s a special market but one that’s growing in appreciation. When I return home in a few weeks I will email more info. Thank you Susan for the nice comments and pingback. I collect electric mixers and eggbeaters and was delighted to come across your site. Now the origin of the mysterious blue plastic eggbeater with Maynard like mixing prongs is revealed to be a Stanley Home product! Many thanks! 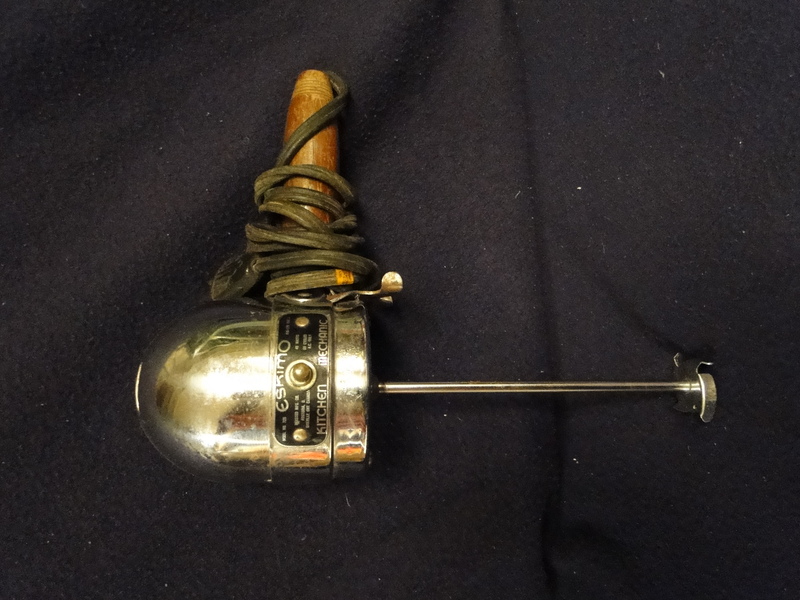 But the GE three beater mixer (only allowed the inglorious name “The Portable Mixer” by GE) is a model from the second half of the 1930s. Nancy, you may be interested to know that I just found, a bought, a copy of the original GE Portable Mixer’s manuel and recipe book on Amazon. Never would have looked without your comment. Many thanks! Sorry, I had not noticed you had two mixers labeled as GE 1921. The first one pictured is a Dormeyer from 1928-1930. 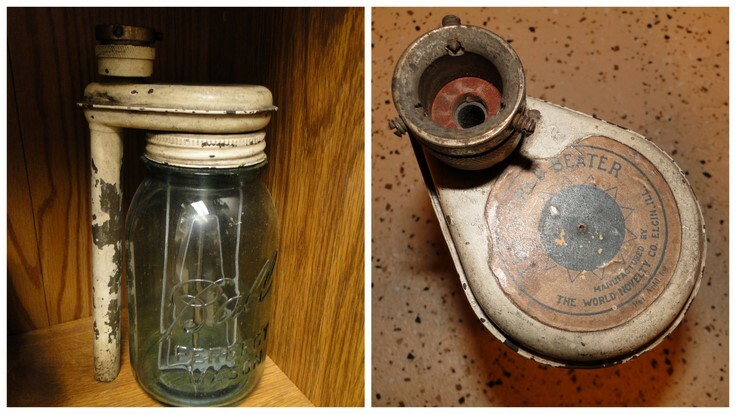 It was patented in 1921 and manufactured independently for awhile independently before it became a Dormeyer product. You’re correct Nancy and I’ll edit the pictures. I don’t know why I made the mistake on the Dormeyer since I’ve had it for years and it’s clearly marked with the 1921 patent and motor manufactured by Hamilton Beach. Curious on the GE 3-dasher. Where’d you find the info? I look for mixer information in magazine ads, catalogs, patents, trade journals and instruction books.. It’s interesting to know when and how the mixer was presented to the public. It’s also great to discover a bowl, attachment or other original feature that I might not know about. Mixers can be a pretty complex thing to collect if you want a complete model. Of course that means more fun hunting for a variety of things! Noticed the Aluminum Beauty eggbeater with the vertical handle. Something else I hadn’t seen before! Thanks! GREAT REVIEW! I pretty much agree with pretty much all you said in your post, especially at the middle of your article. Thank you, this info is very valuable as always. Keep up the good work! You’ve got +1 more reader of your great blog:) Isabella S.
Hi Marc, this is a fascinating and informative article. Especially for someone like me, whose eggbeater collection consists of a couple of wire whisks and the basic kitchen forks. I love historical facts. Thanks! Hi Marc, thanks for the insightful article! 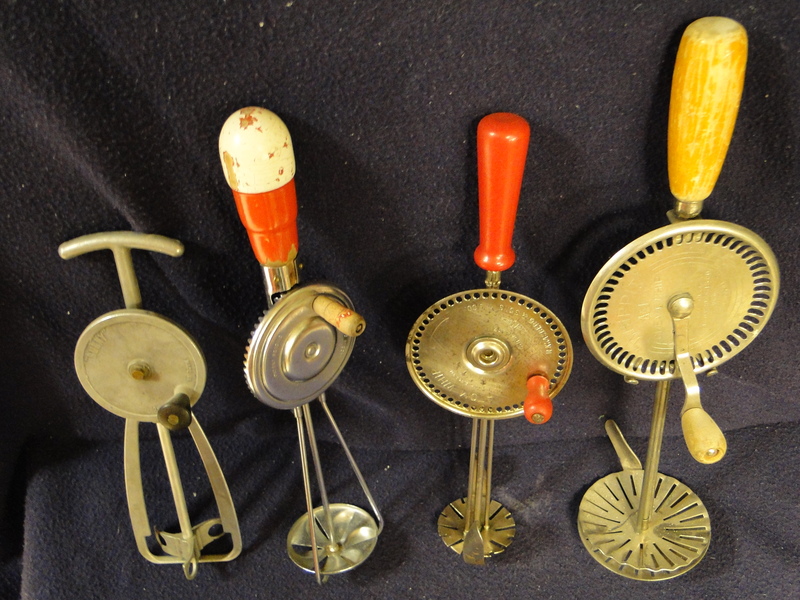 I have the exact 1939 Jiffy Mixer (red top) that’s in the article. I was hoping you could provide me with some information regarding its antique value? Thanks again!